I do not drink cocktails. I have no interest in classic cars. I find bizarre the assumption that because I pursue refinement in clothing I will be interested in the best cigars, hotels or opera. If I am to write a ‘lifestyle’ piece, therefore, this will be it. The beautifully made and beautifully sounding headphones I bought just before Christmas. I’ve had Sennheiser before. I listen to a lot of jazz and the range of sound necessitates a decent frequency response. In terms of quality, cheap headphones are a false economy. But I’m not an electronics geek. I chose Sennheiser Momentum headphones because they use decent quality materials for the ear cups, the headband and so on – the non-technical stuff. Usually headphones that attempt to look more organic or old-fashioned make do with poor-quality materials. 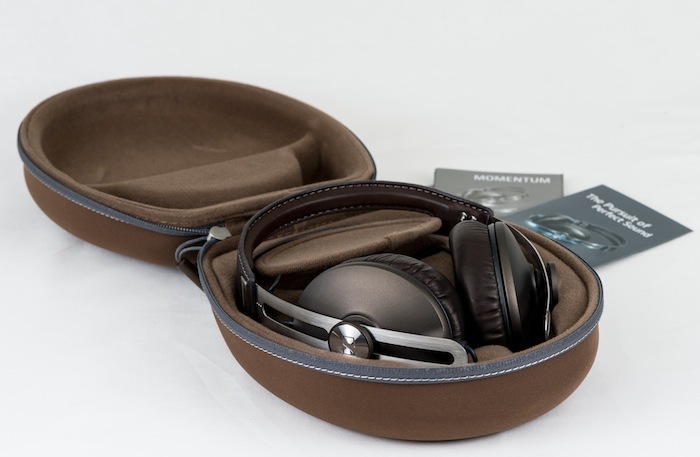 The leather used for the Momentum headphones is vegetable-tanned, in Somerset. The stitching of it on the headband and ear cups is done by hand (ie sewing machine) rather than mass produced. The result is that the cups sit comfortably over the ears and derive their softness from the leather, rather than having a thin skin over a wad of foam. If you want an example of how it’s done badly, look at House of Marley. The overall design is very classic, as is probably obvious from the picture. The brown leather, brushed steel and taupe-coloured exterior to the cup are a very subtle combination. I’m not going to wear Beats headphones for the same reason I don’t wear an IWC Big Pilot’s Watch. Instead I choose these Momentums and my Portuguese. The aesthetic should be consistent; it just doesn’t necessitate smoking or driving. 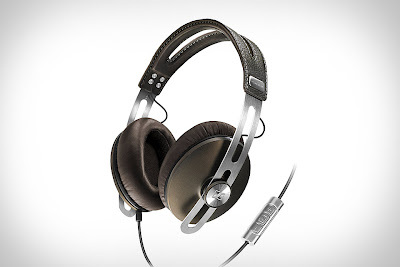 You can follow the discussion on My headphones: Sennheiser Momentum by entering your email address in the box below. You will then receive an email every time a new comment is added. These will also contain a link to a page where you can stop the alerts, and remove all of your related data from the site. You should have had a look at their electrostat offerings! Are they for listening out and about? If not I would certainly have gone with open back. Yeah, a little too pricey for me! And yes, they’re 90% for out and about. for portable and outside i love my etymotic er-4p’s and audeze lcd3’s for home listening. and definitely don’t look at head-fi.org! You don’t really need a portable headphone amp for the Momentums, they were deigned to be easily driven by portable devices. I’m sure it would make a small difference but it’s not really worth the cost or the hassle. I picked up a pair of these for work at a particularly noisy client office. They have a very good sound and as a pleasant surprise work very effectively as a hands free set. Thanks for the recommendation Simon. I noticed that you omitted to state that these headphones cost the exact same amount as the Sennheiser Amperior which also have the same speakers, but yet dont have the stainless steel headband or stitched leather. The reason for this is due to the fact that the Momentums are manufactured with cheap Chinese labour while the Amperiors are manufactured in Ireland, very close to where some of the materials and parts that Sennheiser procures and produces for the Momentums (and used also for the Amperior headphones). Sennheiser have obviously taken great pains to source and state the many quality materials used for the Momentum (including the speakers which are made in Ireland). I would have loved to purchase the Momentums, but for the same reason that this site exists successfully is the reason why I cannot do so. It is at the end, the provenance and calibre of high quality labour, materials and not the aim to ‘cut corners’ to what this site distincts itself from the unfortunate current norm found mostly everywhere else. So you can see my rare surprise and need to comment on this particular post. Why do you say they are lamb leather, I thought they use a synthetic material called Alcantara? I don’t think I do say they are lamb leather? Alcantara is a synthetic suede.